Gottfried August Homilius (1714-1785) is not a household name nowadays. Serving as church music director at the Kreuzkirche in Dresden, he was considered very highly in his own time. According to the booklet, Ernst Ludwig Gerber (1746-1819) counted him “without contradiction our greatest church composer”, while Johann Friedrich Reichardt (1752-1814) called Homilius “now definitely the best church composer as well as the greatest organist I have ever heard and perhaps will ever hear in my life”. Opinions on Homilius from the 19th and the 20th centuries, however, were not so kind. Much of Homilius’s music was not published. Before 2004, only a handful of CDs of featuring his works existed. 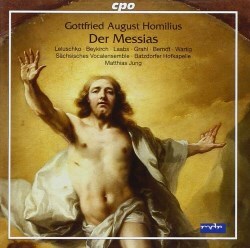 There have been twenty or so recordings since (many from the Carus label), the latest of which is this CPO recording of Der Messias (The Messiah). My only prior experience of Homilius’s music was a recording of his oboe sonata. I found it not the most inspired music. This recording of Der Messias hasn’t changed my view – the music is pleasant but not at the same artistic level as similar works by Bach, if that’s a valid comparison. Der Messias HoWV 1.6 is an oratorio passion set to freely penned texts. It was first performed at the Frauenkirche in Dresden on Good Friday 1776. Despite its title, it is not related to Handel’s work. The rhythms and melodies show some characteristics of the transitional period from baroque to classical. Although Homilius supposedly studied with Johann Sebastian Bach, his music doesn’t bear much resemblance to that by the master. The recorded sound is natural and clean. In fact I wasn’t aware that it was a live recording – there was no trace of audience noise or applause. The playing of the period-instrument ensemble Batzdorfer Hofkapelle is stylish and technically accomplished. Except for Meike Leluschko, all of the solo singers were trained in the eastern part of Germany - three of them in Dresden. The all-German cast sing well, with good diction, as would be expected from native German singers. The 2-CD set is packaged in a slim-line double case. The 40-page booklet is of high quality, as one would expect from CPO. Detailed information on Homilius, Der Messias as well as the performers is provided, and the full libretto is given in an English translation alongside the original German. This is a recording made in Dresden by a period-instrument ensemble, choir, soloists and conductor all based in or near Dresden, of a work that was from Dresden. It has a legitimate claim to authenticity. While the work itself is not at the level of the more famous Messiah or Bach’s passions, it is a good starting point for anyone interested in exploring works by Homilius.